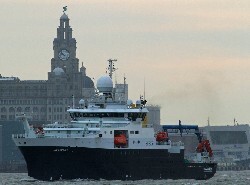 Moored at Liverpool docks, the brand new RRS Discovery looked impressive - her stunning black and white hull silhouetted against the Mersey skyline. My cruise was a two-night voyage to Southampton. With excitement mounting I waved goodbye to land and climbed up the gangway. During my first time at sea I had discovered that the long hours, seasickness and lack of space over long periods add up to one thing — life onboard a research cruise is very hard work. Despite this I jumped at the opportunity to go on Discovery. What could be better than to experience life at sea without being up at 4 am for the morning CTD! My spacious cabin aboard the new Discovery had a TV and two portholes, all of which made for a luxurious voyage. I watched a fantastic sunrise one morning and one of our group even spotted a dolphin go past! The well equipped gym, movie room and bar will prove essential for scientists and crew needing to wind down at the end of a long shift. We soon felt the effects of being at sea — the rough weather in the Irish Sea looked ominous from the aft deck as we were battered with wind and rain. This was a different side to life on the oceans from the calm blue tropics that I experienced on my previous cruise. With a 360-degree view and an occasional distant craft sailing by on the horizon you become acutely aware of your dependence on the ship. The experience awakens the spirit of adventure yet also brings a sense of tranquillity when your company is restricted to the birds following behind and the hidden life beneath the sea suface. As we rounded Lizard Point in Cornwall we spotted the lighthouse blinking in the distance. Suddenly land was in sight, beautiful though poignant as it meant the cruise was nearing its end. The highlight of the trip was the sunrise as the ship passed The Needles off the Isle of Wight. The grey morning looked like an Arctic dawn, as Discovery glided silently past the battered–looking chalk stacks. Curious onlookers gave us a wave and took photographs as we passed through the Solent and Southampton Water. I hope it sparked their interest and led them to find out more about Oceanography (and the data management behind it). As a data scientist, research cruise experience is invaluable. You meet the scientists that we work with daily to ensure smooth data and metadata collection. This cruise was a fantastic opportunity for two British Oceanographic Data Centre data scientists to explore the ship, meet the crew and collect information on the ship’s sensors, which will prove vital when we need to archive data from future cruises. Working here at BODC, I feel I help data continue on their journey from the depths of the ocean to the wider public, where they advance understanding.